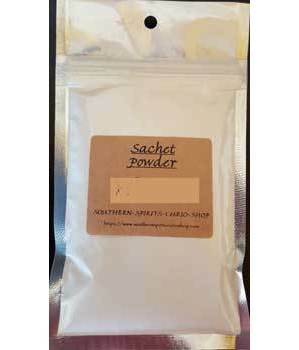 Sachet powder or sprinkling powder can be used in many ways. Either sprinklged in a place that the target will come into contact with it or used on the person as a dusting, with this traditional Hoodoo formula the sky is the limit. Made using hand ground herbs, essential & fragrance oils. Ingredients: Tapioca Starch, Arrowroot powder, Baking Soda, Kaolin clay & fragrance.